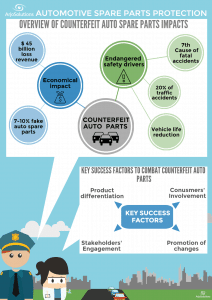 Counterfeit Parts – What’s the Real Story? You may have noticed recent press coverage on the purported rise of counterfeit parts entering Australia in recent months. Coincidently these reports only started hitting the media following the launch of the FCAI’s ‘Genuine Is Best’ campaign which is a communications campaign funded by the car industry to encourage the Australian public to buy only ‘genuine parts’ through their dealership channels. Respected independent journalist Robert Pepper from Practical Motoring takes an objective look at the differences between car parts and the evidence of counterfeit parts in Australia in the following article and states “It is hard to escape the conclusion that the FCAI’s objective is more about trying to scare car owners into using only OEM parts which are highly profitable for its members, rather than truly trying to educate the Australian public about the real pros and cons of different car parts”.